Despite its name, puppy chow (or its cousin, muddy buddies) is a snack very much intended for human, not canine, consumption. It is, for many, a beloved treat for children and party snack for all ages. Although countless varieties exist, most people puppy chows contain the common ingredients of cereal, white chocolate and powdered (confectioner's) sugar; additional sweet and salty ingredients (small candies, peanut butter and other snack foods such as pretzels, etc.) 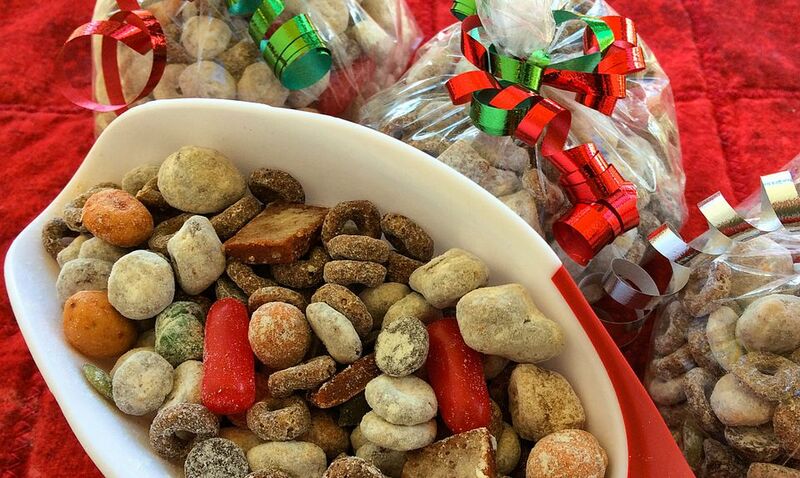 turn a plain puppy chow into one appropriate for a certain season, holiday or special occasion. This puppy chow recipe combines several classic sweet and salty Mexican elements to produce a snack mix that's sure to be a hit north or south of any border. Don't miss the list of possible alternate ingredients underneath the recipe, because once you've tried the basic version, you'll want to continue to experiment with the vast world very mixable of sweet and salty flavors. *Asterisked Mexican ingredients are often available in a large supermarket; if that is not the case in your area, they are common in Mexican or Hispanic grocery stores, or can be obtained online. Unwrap the tamarind candy. Use kitchen scissors or a sharp knife to cut the tamarind candy into 1/2-inch cubes or squares. Measure the confectioner's sugar, chile and lime powder, cinnamon and anise (if using) into a large zip-top plastic bag. Seal the bag and mix thoroughly. Set aside. Melt the candy coating, either in the microwave or stovetop in a double boiler. Immediately scoop the candy-coated cereal into the bag with the sugar and spice mixture. Reseal the bag and shake the contents all around until all of the sugar has adhered to the candy coated cereal. Pour the coated cereal into a large bowl. Add the reserved (uncoated) cereal, the gummy candies, tamarind candy pieces, peanuts, pumpkin seeds and chocolate chips; mix again. Pour your delicious Mexican puppy chow mix into a serving bowl (or ladle it into individual containers or bags) and enjoy!